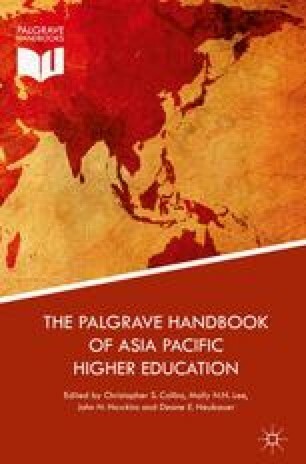 This chapter presents recent changes in Japanese higher education policy, and analyzes its impact upon higher education institutions (HEIs). It can be assumed that in the twenty-first century, economic forces will increasingly demand the production of new knowledge and the development of personnel through universities. No governments will be able to continue meeting such social demands for higher education without relatively abundant financing. Without question, Japan faces the same challenge. Both the private and public sectors of higher education in Japan will continue to confront limited financing, and issues of accountability will continue to emerge. In such an environment, government control becomes stronger ever than before. In 2014, School Education Law and National University Corporation Law were revised in order to establish the leadership of the president and strengthen university governance. New law will be effective in the year 2015. The issue of university governance has become a matter of extreme importance. Given an existence of strong accountability issue, it is imperative to examine the relationship between government control and higher education policy and how the higher education policy influences the quality issues of university education. In this chapter, first, I present the overall picture of Japanese higher education policy after1990s and then, how the higher education policy shifts to strengthening the government control for the quality assurance of Japanese HEIs. Japan Society for the Promotion of Science (JSPS). 2012. Project for promotion of global human resource development. Japan Society for the Promotion of Science. Available online at: http://www.jsps.go.jp/j-gjinzai/data/shinsa/h24/gjinzai_gaiyou_b26_e.pdf. Ministry of Education, Culture, Sports, Science and Technology (MEXT). 2005. FY2005 white paper on education, culture, sports, science and technology. MEXT. Available online at: http://www.mext.go.jp/b_menu/hakusho/html/06101913.htm. ———. 2010. FY2010 white paper on education, culture, sports, science and technology. MEXT. Available online at: http://www.mext.go.jp/b_menu/hakusho/html/hpab201001/1326588.htm. ———. 2013. Summary of survey results on international research exchange for FY2013. MEXT. Available online at: http://www.mext.go.jp/english/report/1360442.htm. The Council on Promotion of Human Resource for Globalization Development. 2011. An interim report of the council on promotion of human resource for globalization development. The Council on Promotion of Human Resource for Globalization Development. Available online at: http://www.kantei.go.jp/jp/singi/global/1206011interim_report.pdf. Accessed 1 Dec 2014.